I had the idea of an outdoor balloon shoot for awhile and had been wanting to do this shoot with my business colors grey and yellow which also happen to be one of my favorite color combinations right now so I was soo excited when an opportunity came about to utilize my idea in a shoot. I was SO excited when Dylan’s Mom contacted me wanting to set up a suprise couple’s shoot for Dylan and his girlfriend Adriana. I thought this would be a perfect opportunity for the balloon shoot idea because it would be a great way to make this suprise semi-believable. Dylan’s Mom had the idea to tell Dylan and Adriana that someone needed a model for a photoshoot to practice something on so they had no idea I truly was a photographer, that this session was planned and set up by their Mom for Dylan’s birthday and that they would receive the disc of photos like any regular client. I had never met Dylan or Adriana so I played the part in acting like I needed models and thought that the balloons would be a perfect way to stage that I needed models for a shoot. The day of the shoot came and it was extremely windy and I was pretty nervous this awesome outdoor balloon idea was not going to work because the lady at Kings Variety where I had bought the balloons from had said if there is any bit of wind outside the balloons tend to just go to the ground. It was just my luck that there were storms rolling through that afternoon which is when the shoot was originally planned and because I bought a bajillion helium filled balloons the prior day, I was determined I was doing this shoot no matter what to utilize all these balloons I had. I contacted Adriana the morning of the shoot and we were able to move the shoot up as early as we could but it was still extremely windy and sprinkling already. My awesome husband came with me to stake all of these balloons into the ground (he is amazing) and as we approached the park I realized the open field I orginally had wanted to do this in was absolutely not going to work. It was soo windy all the balloons would literally lay flat on the ground. Luckily there were some woods down below that would help block the wind a bit and we staked the balloons and kept our fingers crossed this would work. Everything turned out beautifully and the sun even came out halfway through the shoot, and Dylan and Adriana couldn’t have been more perfect. They were absolutely adorable together and so playful with another. 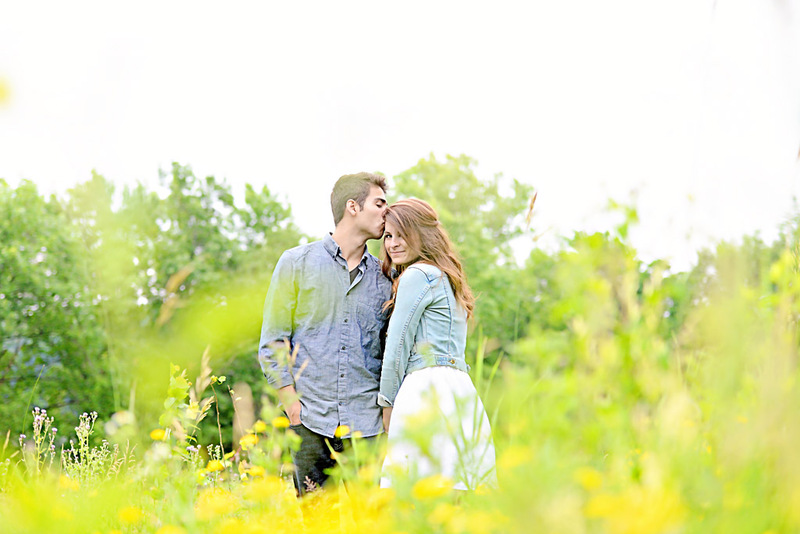 I had such a blast capturing how in love these two are and it was great getting to know them throughout our shoot. Couples are one of my favorite sessions to photograph because I love capturing love and relationships and all of the fun mooshy stuff. Many people have asked about the balloon shoot so I may be doing a day or two of mini sessions with this set up in the fall. Keep your eyes open for fall mini sessions on my facebook page, but for now here are some of my favorites from Dylan and Adriana’s Session. Fantastic idea.. Love all of the images in this blog post!